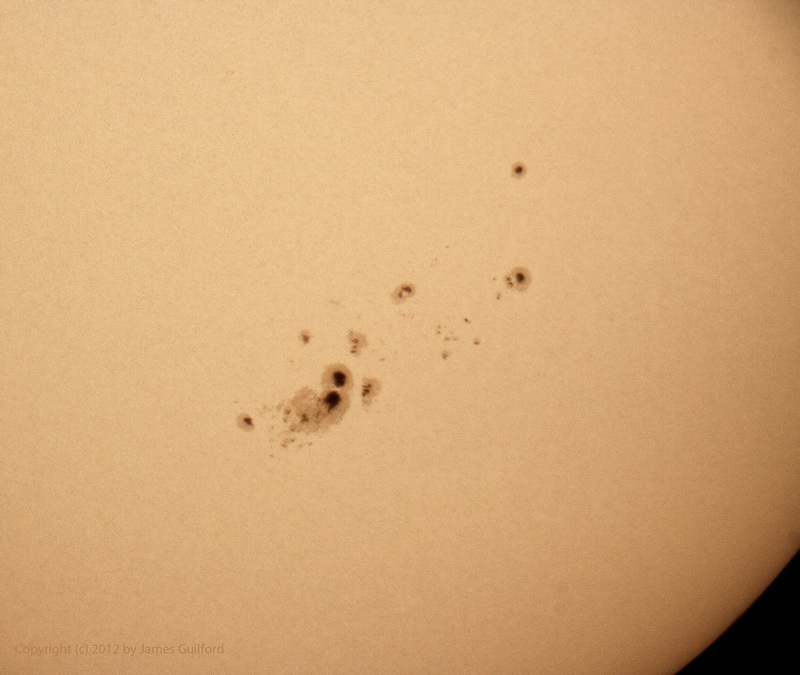 Sunspot group AR1520 with improvised camera attachment (handheld). Hosting a group of kids from a local church camp this morning, we were treated to the best views of sunspots I’ve ever had. 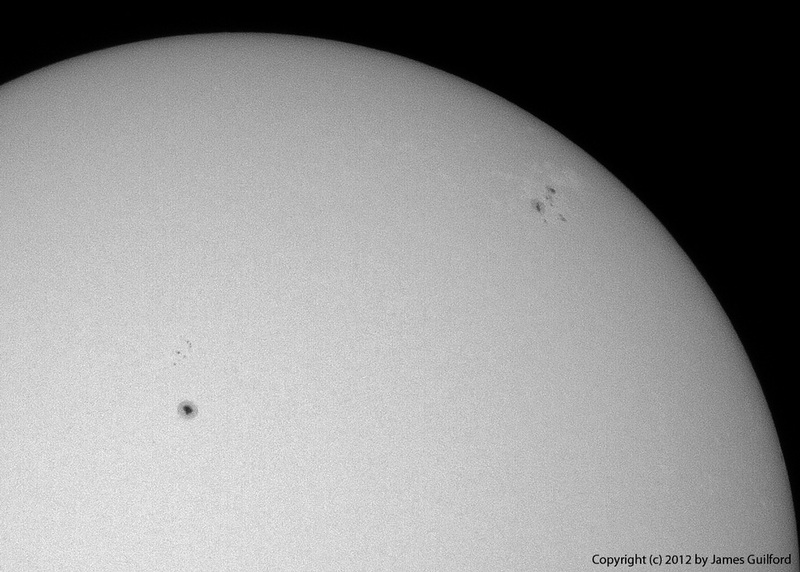 Sunspot group AR1520 is absolutely enormous, dominating the face of the Sun and observing conditions were very good. We viewed the Sun at about 30X and, later, at about 120X through Stephens Memorial Observatory’s 112-year-old refractor fitted with a white light solar filter. After the campers left I hauled out my camera and discovered I had the wrong direct-focus adapter with me and could not focus at all! So I removed a piece, focused as best I could, and hand-held the camera for a direct-focus image. The resulting image (above) is soft, not doing justice to the telescope or the sunspots, but the view is impressive, nonetheless; it’s a representation of what we saw which was truly amazing! 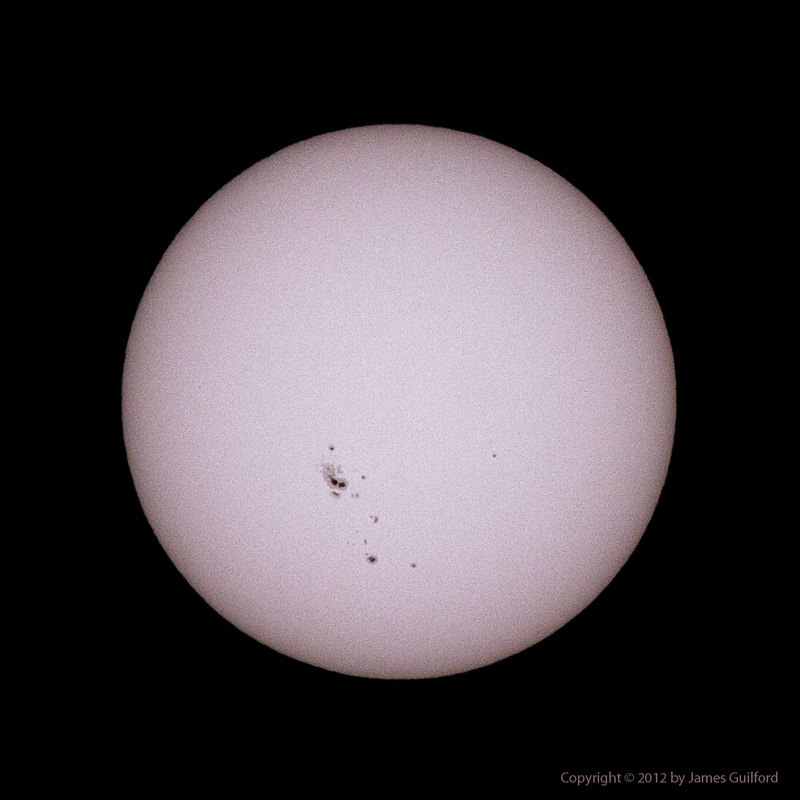 Whole disk image of the Sun using 400mm lens and white-light filter, Thursday, July 12, 2012. The Sun as it appeared the morning of May 24, converted to monochrome. Vacation Day #4 and I spent some time this morning experimenting with solar photography. On June 5, the transit of Venus will take place and since the next one after that won’t happen for another 115 years, I thought I should try for this year’s! I discovered to my dismay that the very expensive, modern-design, Herschel Wedge won’t work for photography with my “big” telescope — the six-inch, 1,219mm Meade LXD75. Rats! I’m going to make quick queries to see what I can do to resolve the issue if I’m to use the wedge any time soon … and June 5 is soon! I could not crank the camera “in” close enough to achieve focus with the wedge in place. So with the telescope still set up in the mid-morning sunshine, I removed the wedge and covered the telescope’s objective lens with the very inexpensive AstroZap filter made using Baader AstroSolar film. I connected my trusty (and light-weight) Canon Digital Rebel XT to the scope’s eyepiece holder and made several bracketed exposures. Later I discovered the results were very good though not quite as good as shots made with my Canon EOS 50D and Canon 400mm telephoto. The difference in quality may be attributed to seeing conditions –the images were made days apart– but either setup will do just fine for recording the historic celestial event. Now all we need is clear skies on that day! A few nights ago I did a bit of fixed-tripod astrophotography to attempt to capture the conjunction of Venus and the Pleiades. I had to work pretty hard to salvage the conjunction photo but wasn’t all that pleased with the results. Since I had a decent clock-drive sitting mostly unused, I decided to mate my camera to that and see what I could get. Not a pioneering venture, to be sure, but I’ve actually never piggybacked a camera to a telescope before! A quick trip to the local Ace Hardware store produced the stainless steel quarter-inch screw and a pair of rubber automotive washers I’d need to mate the telephoto lens tripod mount to the telescope’s dove-tail mounting bar. Shortly after dark on this clear but full Moon-lit night, I toted the Orion SkyView Pro tripod and mount out to the sidewalk. 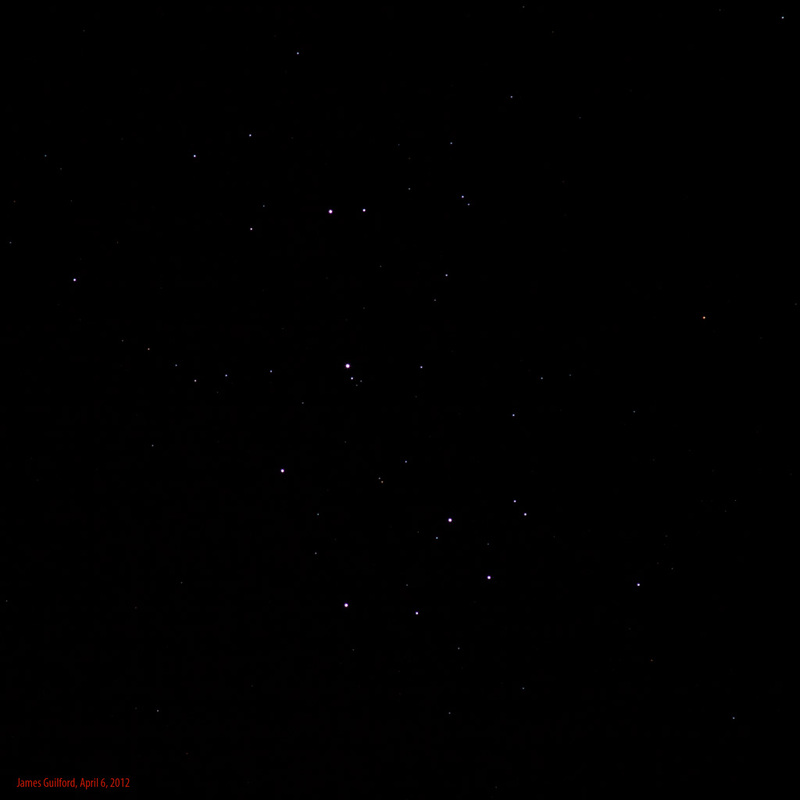 After a rough alignment with Polaris, I attached the camera rig to the mount and did 10 exposures: about five each of Orion’s sword and the Pleiades star cluster — both in the twilight western sky. I’ll definitely need to use the DSLR’s advanced feature that allows its view finder mirror to flip up before beginning exposure — several shots were ruined by vibration. Focus was a bit more of an issue than I expected. Tracking? 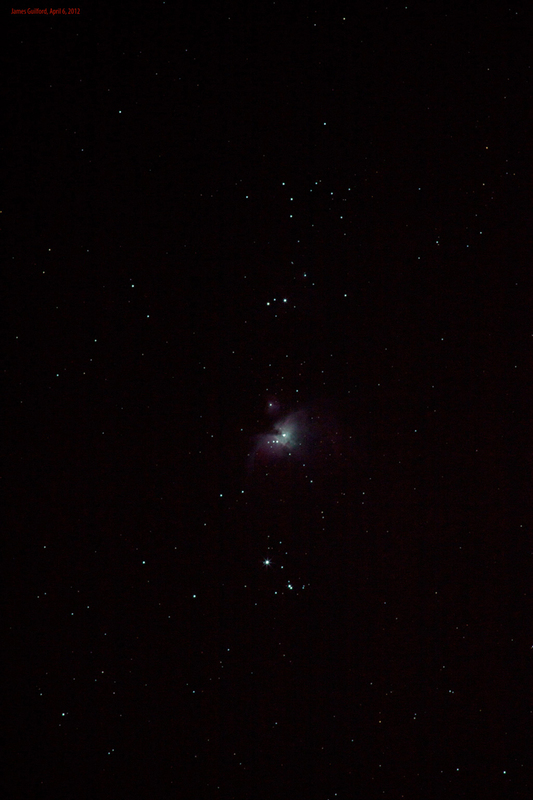 Well, I expected it to not be perfect but it appeared good enough for exposures of up to 15 seconds. Given all that, I’ll share my results here. I know they’re not very good but I also know that, using this same camera gear with better mount and alignment, I’ll be getting some very nice images of the stars in the not-too-distant future! Earth's Moon as seen through 110-year-old glass. I had to deal with thin clouds and a late-arriving Moon Saturday night; things turned out well, however, and included surprises. I’d feared clouds that made Jupiter hazy looking and most stars invisible would mess up the view. Between the excellent telescope and Jupiter’s size and brilliance we were given delightful views of the giant world. The equatorial cloud belts were nicely defined and there were glimpses of additional bands north and south of them. I also got my first confirmed sighting of the Great Red Spot … it was faint and intermittent but really there. We were also treated to the slow progress of Jupiter’s moon Io moving closer to the planetary disk and begin its transit. Shortly after Io began its crossing in front of Jupiter it was visible against the south equatorial belt before it disappeared into the planet’s glare. I’d hoped to see Io’s shadow on Jupiter’s cloud tops but seeing conditions deteriorated later in the evening. Unfortunately I’d made a mistake back in judging when Earth’s Moon would be visible to us this night … back in January or February when I was making up the schedule. Visitors climbed high on the ladder with the telescope nearly horizontal to get a look at the Moon. What they saw was an orange-tinged orb shining hazily through clouds and obscured by the naked branches of a neighbor’s tree. Sill, they could see the lunar seas and craters and many said they appreciated the moodiness! That’s making the best of a sad situation. By closing time the Moon had risen much higher, clear of clouds and trees. Only a professor from Kent State University and a student from one of his classes were still under the dome with me. I aimed the ancient nine-inch refractor at the Moon, changed to my favorite vintage eyepiece for lunar observing (a fist-sized, low-powered piece of brass and glass) and let them take a look. The professor, also a very experienced observational astronomer, remarked over and over about the wonderful quality of the view he was getting. 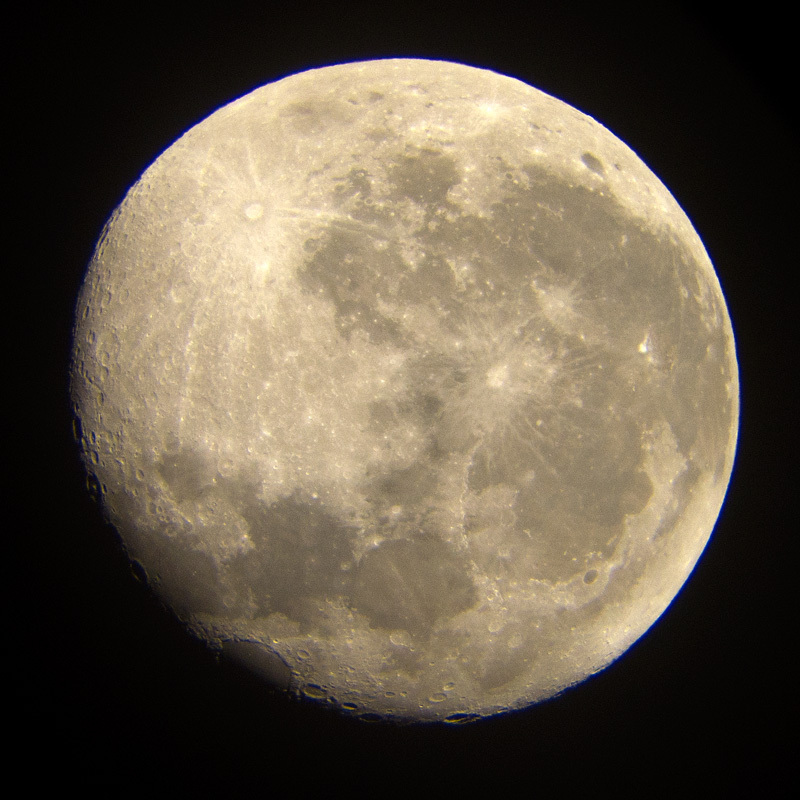 He said the 110-year-old instrument was delivering the finest views of the Moon that he had enjoyed in 40 years of observing, and that made my night! I did not build or donate the observatory’s telescope. Nor have I completed restoration of the telescope’s finish and mechanical drive. The optics are the thing, however, and I’ve always said the telescope’s best and highest purpose is its continued use in astronomy. Entertaining and educating visitors of all ages and thrilling seasoned astronomers is pretty cool. After my last guests departed I pulled out my little Canon PowerShot camera to try and capture the view of the Moon that had so thrilled a few minutes earlier. It’s tricky to do this, especially handheld, but sometimes the “afocal” technique works: you hold the camera to the eyepiece, about where your eye would go to look through, get the image perfectly centered and focused, and trip the shutter. I was rewarded this time with some very nice pictures to help remember the occasion. A busy and stressful week awaits me at work and I know I’ll wistfully look at the Moon photo more than a few times as relief. Though battered, the Moon endures to shine as, perhaps, can we. 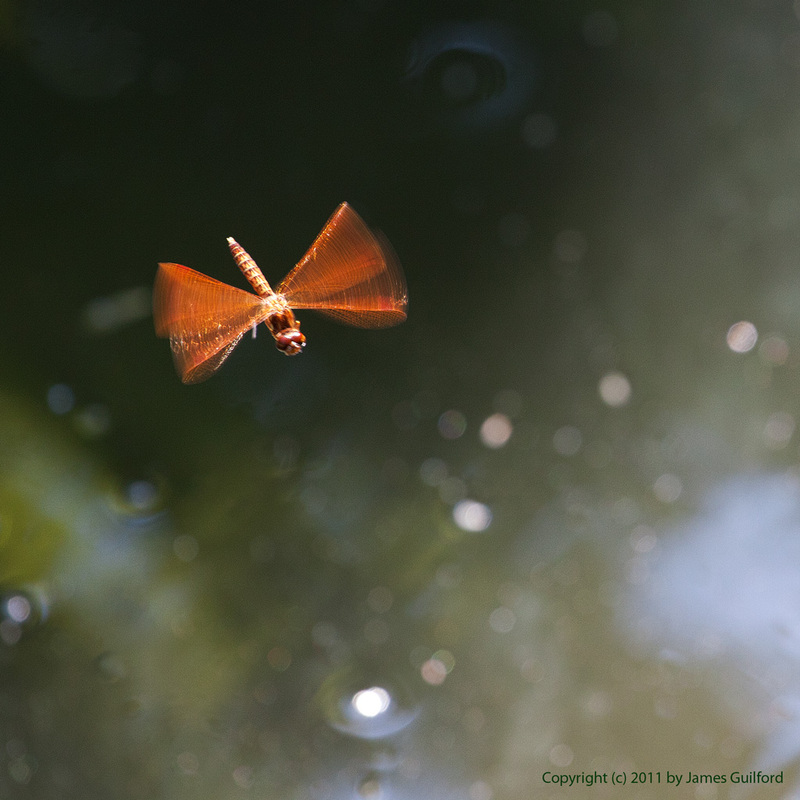 Red dragonfly in flight over sparkling water. Saturday night was spent at the Observatory showing off Earth’s Moon, brilliant red giant star Antares, a faint star cluster, and the Ring Nebula to a nice group of folks. The sky was mostly clear but high humidity and moonlight make for less than optimal seeing. Still, our visitors were interested and enthusiastic. Views of the Moon were exquisite and exciting with craters along the terminator showing off inky black unlit floors and brilliantly sunlit walls. Mountains cast deep shadows across the lunar seas. The old telescope was in fine form. Two couples stayed late and we enjoyed the night’s best views of the Ring as I changed out eyepieces. As they were leaving we stepped out on the front lawn talking and looking at some constellations, parting company at 11:25 PM. That meant a very late night for me but the overall experience was so positive, I didn’t mind at all! Today we got around slowly and, because the day promised to be uncomfortably hot and humid, we went to the zoo early enough to arrive a little before opening. We saw some wonderful exotic animals ranging from meerkats and elephants in the zoo’s new Elephant Crossing area to flamingos, lions, giraffes, and storks. We took loads of pictures but, as these things often happen, my favorite photos were of free-flying, native dragonflies that were buzzing around a small pond on the grounds. It was an all-too-short weekend of cosmic smoke rings and flying dragons. 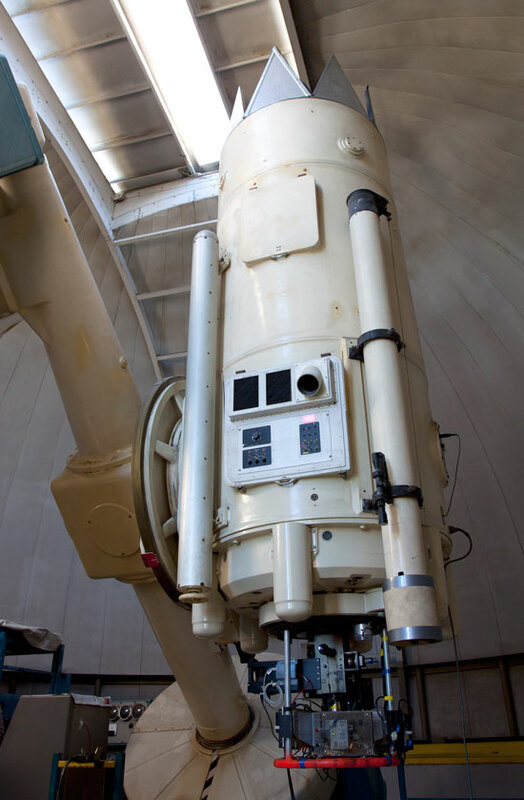 The dome at Ritter Observatory will soon open on to a starry sky in Toledo, Ohio. As guests of the Toledo Astronomical Association and the University of Toledo’s Astronomy Department, She and I received a grand tour of the Ritter and Brooks Observatories the afternoon of October 1. Grand it was! First we saw the century-old six-inch “Brashear” telescope of the Brooks Observatory. It is perched high atop a building on campus and serves as the centerpiece of the Department’s public outreach effort. The fine old scope is in an unfortunately cramped dome that makes use difficult. Nonetheless hundreds view through it every year. The big –and I do mean big— surprise came when we visited the Ritter Observatory. A white stone multi-story building is capped by a large white dome. Inside that dome resides the largest telescope in Ohio, the centerpiece of the University’s Ritter Astrophysical Research Center. Built in 1967 by Cleveland’s Warner and Swasey Company the Ritchey-Chretien reflecting telescope is equipped with a 1.06-meter mirror made by Owens-Illinois glass. 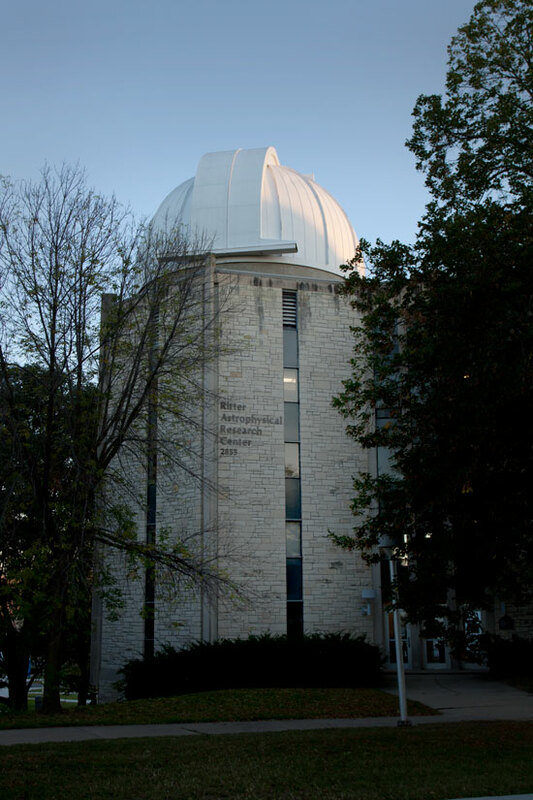 Despite being under Toledo’s “light dome” and located on a busy city street, the big instrument is employed nightly in research projects that are largely unaffected by the light pollution: spectrographic work involving “long-term monitoring of variable stars that have winds, circumstellar disks, or active envelopes”. It was surprising and exciting to see a telescope of that class close-up and to learn it is actively used in astronomical research. Also fascinating is how the instrument has been integrated into the building itself, occupying more than one floor with fiber-optic and electronic conductors leading to other floors for data gathering, analysis, and telescope control. Quite fascinating. A grand tour, indeed. Largest telescope in Ohio is the Ritter at the University of Toledo. Its mirror has a diameter of 1.1 meters.